Employ specific preparation techniques if you are planning to refinish wooden canoe paddles. These paddles are sealed with a protective varnish coating that makes them resistant to warping and rot; this same sealer makes the paddles resistant to new finishes. Remove this coating prior to application or the paddles will not be able to absorb the new finish. Remove the varnish sealant from the wooden canoe paddles using 120-grit sandpaper. Sand with the wood grain until the paddles appear dull. Use sticky tack cloths to remove sawdust from the paddles. Apply painter's tape to portions of the wooden paddles that should remain unstained. Overlap fabric and plastic drop cloths. Set the paddle on top. 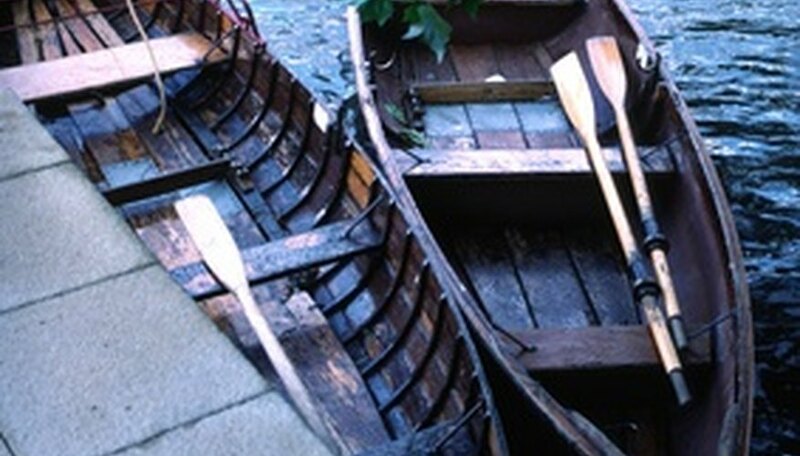 Coat the wooden canoe paddles with oil-based stain. Use a paintbrush manufactured for use with oil paints. Wait 2 hours for the stained paddles to dry. Add additional coats for darker results. Skip this step if you don't want the paddles stained. Wait 10 hours. Apply varnish or wood sealant to the wooden canoe paddles using the clean paintbrush. Wait 24 hours before using the paddles. Don't sand against the grain of wooden canoe paddles or you will splinter the wood. Don't apply fresh varnish or stain directly over varnished paddles. Doing so will lead to problems with absorption.